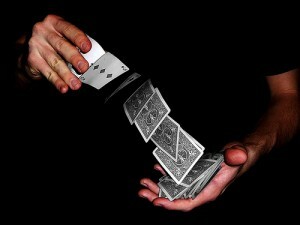 Card tricks are considered to be the easiest way to amaze the audience at a magic show. However, people don’t know the fact that it is quite easy to play with math, probability and cards. You need to have a good memory and quick hands; and you can easily master the card magic tricks. Here is a list of few tricks which are definitely going to wow your audience and will leave them in awe. All of them are quite easy to learn and will only require a few minutes for you to master them. Simple trick that only needs two people to perform. The performer makes a prediction and the spectator is somehow informed about that prediction. Quite a technical trick to learn, but once you are able to pull it off, all the audience is left in awe. Basically you show them 4 Kings in the start and eventually manage to exchange them with 4 Aces. This trick is not only easy, but extremely cool once you show it to the people. You eventually manage to turn the card which the other person wants you to pick. Another cool trick which will simply amaze the audience. After asking the spectator to remember a certain card, the performer manages to pull it off from the deck in the fifth go. This is actually a self-working card trick. You need to put all the cards in order and would also require the player to follow a proper sequence. A magic trick that will require limited amount of people and will leave them all amazed at the end. This is more of an illusion which you create in front of the audience. This will most definitely leave all your audience in awe. This trick requires you to be good at math. You need to number the cards and voila, you can master this trick in a matter of minutes. This only requires good reflexes. You should know how to switch between two cards quickly and the audience are just left surprised once the trick is over. This is a memory card trick. You simply need to remember the location of four aces and you are good to go.